We love a good casemod here at GeekTech--whether it is an Xbox 360 Transformer or a Tron Bike tower PC--but we rarely ever get to even see the guts inside of these artsy machines. This video by Richard “8-Bit Builder” Clinton is an extreme exception to that trend, as he shares a time-lapse build of his latest creation based on a 16-Bit Link from The Legend of Zelda: A Link to the Past. The video is an incredible mix of block building and a remixed soundtrack of classic “Legend of Zelda” tunes. The final Link case is pretty sweet, and it comes complete with a glowing sword that's ready to unleash that Knights of Hyrule patented spin attack. If you want one of your own, the time-lapse is a fairly complete documentation of the build. Of course, you could just buy one from Clinton through his 8-bit Builder Etsy store for $2,400, and he’ll even make one to your parts specifications. 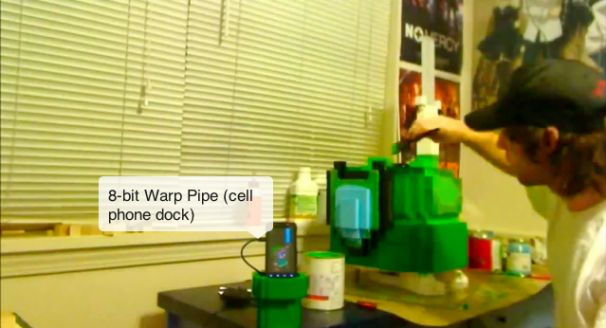 Oh, and that 8-bit Mario Land Warp Pipe you might have spied during the video is up for sale too for $50.